(L-R) Kimber Riddle, Kim Brockington. Image by Steven Schreiber. Attorneys, judges, and a stupendously effective set dominated by piles of documents that become a testament to procedural futility in the face of personal, social, economic, interpersonal violence. 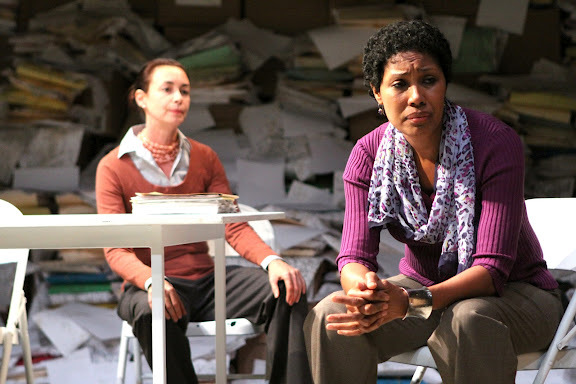 The theatrical world created by Catherine Filloux‘s Luz is bounded by legal papers and files addressing citizenship and deportation and immigration, and by supertitles that illuminate Spanish language dialogue as necessary to tell the stories of several women. In this world Luz (Julissa Roman) and Helene (Lynnette R. Freeman) and Zia (Kim Brockington) work with their legal advocate Alexandra (Kimber Riddle), support each other, and build a potent world of poetry, power, pain, and resolution. Director Jose Zayas orchestrates smooth transitions between scenes portraying civil legal procedural maneuverings and scenes in remote locations including an inhabited Guatemalan garbage dump and a Haitian tent city. One of the common threads through the women’s stories that haunt and animate this tone poem of a play is the legal advocate Alexandra who remains a bit of a cipher as a character. This story isn’t her story (as conventional tellings of similar theatre stories often suggest) and we don’t focus on her own back story and what has drawn her to this particular legal specialty. Her character’s purpose is to defend in legal proceedings and by this commitment and these actions to illustrate the words and actions and events behind the figurative and literal piles of papers occupying the upstage wall and stuffed within file cabinets that line the walls of the La MaMa playing space. The stories belong to the abused, needy, striving women. Puppets illustrate, animate, aggravate our characters and tie together various stories. Public relations man Oliver (Steven Rishard) is haunted by a puppet Roasted Swan, perhaps representing environmental harms caused by the firms he represents. A vulture puppet appears in several scenes. Both are animated enchantingly (and menacingly) by puppeteers Chloe Moser and Kiku Sakai. Maruti Evans‘ set design, dominated as noted by the piles of papers, is visually powerful, metaphorical potent, and aromatically stunning. The room of shoes at Washington D.C.’s Holocaust Museum similarly crafts an image that stuns amid a haunting aroma — in that the sour smell of rotting shoe leather, in Evans’ design the sour smell of old paper. A world of sights, sounds, smells, to frame these stories of oppression and hope.